I have never been a fan of the Romantic poets but you cannot escape them in the Lake District. 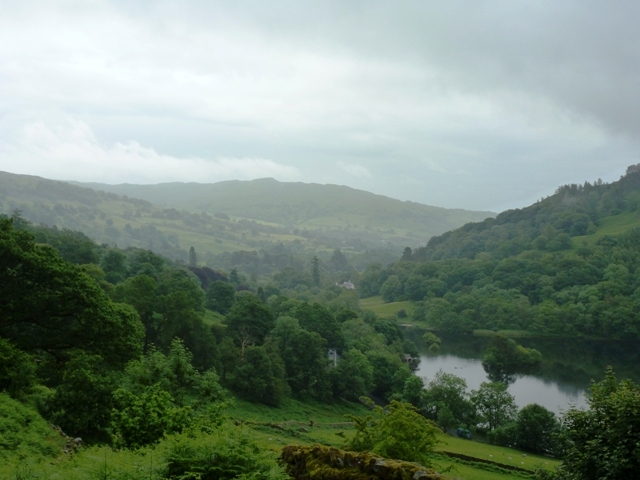 Their poetry and images litter the tourist offices and busloads of foreign tourists are brought in for the day to see where Wordsworth et al lived and worked. 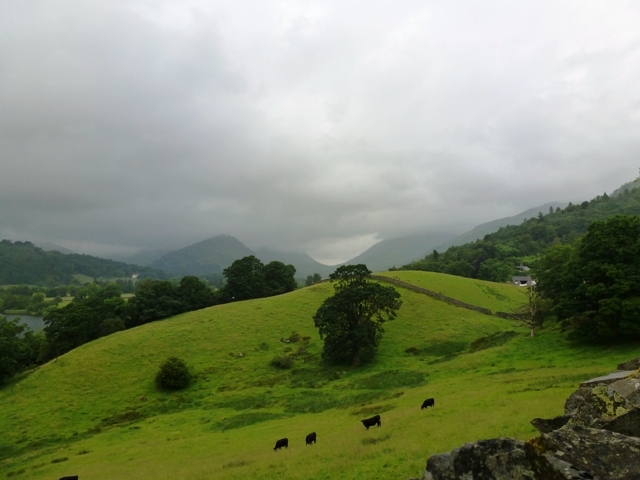 Now, I’m not a reader who finds the idea of visiting an author’s home-turned-museum at all appealing (even for authors I love), so I happily gave those sights a miss, but I did still end up in Wordsworth country. 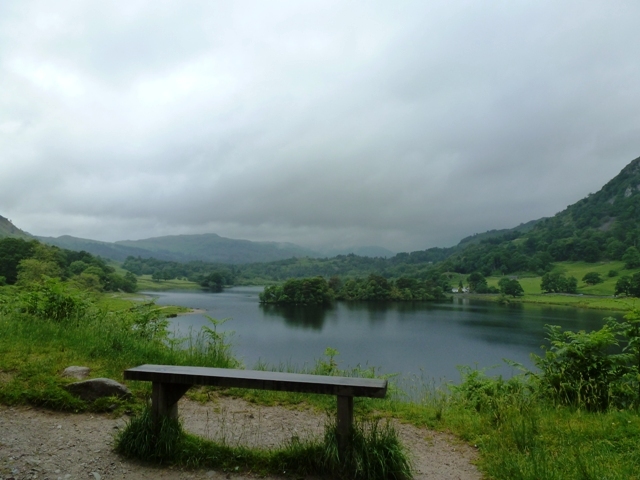 One drizzly morning, we drove down to Grasmere and took a lovely walk along the old coffin road to Rydal village and then along the far side of Rydal water. 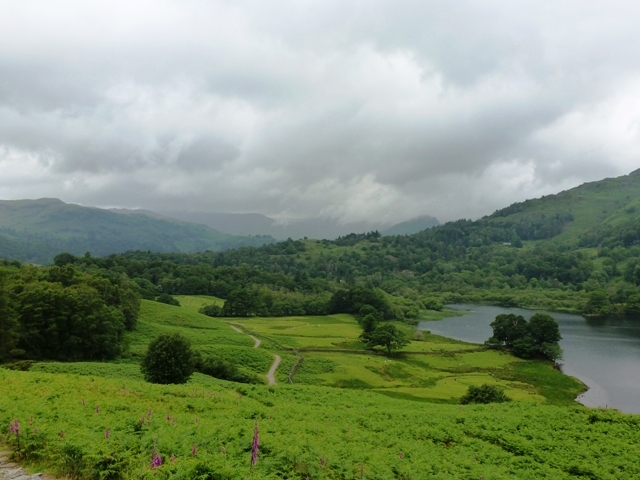 It was such a gentle landscape compared to what we had already seen further north and even I had to admit that Wordsworth knew what he was about in settling there. 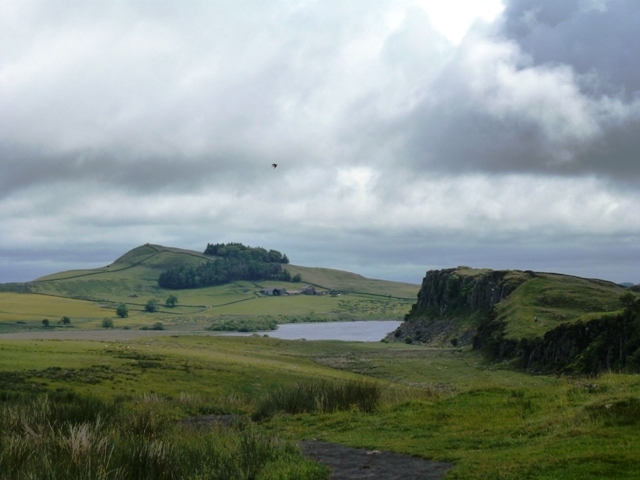 Another day, we headed north from the Lake District to visit Hadrian’s Wall. 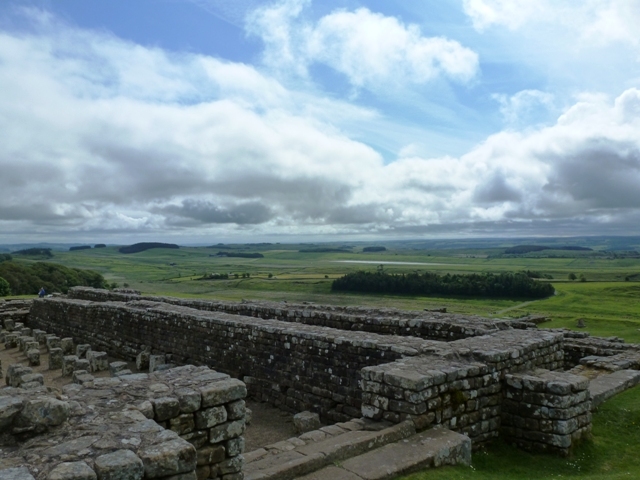 It was a place my parents had been particularly excited to visit, having both been fascinated by the Romans as children, and it more than lived up to their expectations. 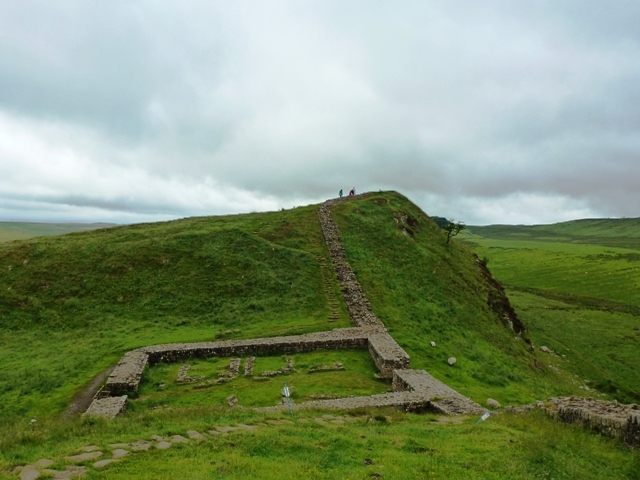 We walked along a portion of the wall and visited Housesteads Roman Fort, marvelling at it all and trying to imagine what it must have been like almost 2,000 years ago for the soldiers stationed there. Rather bleak, one suspects. 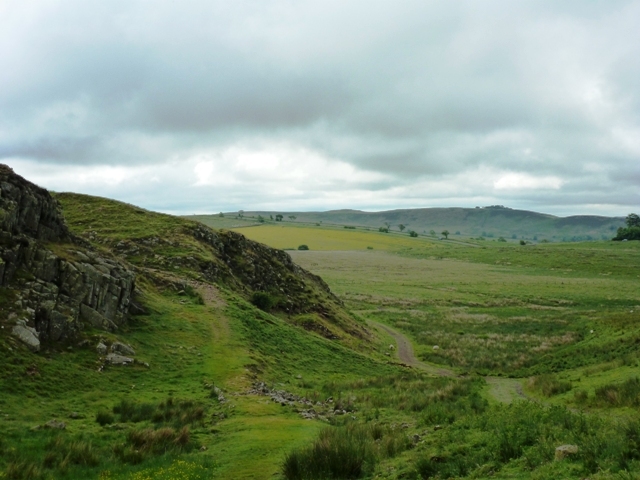 It is a striking and beautiful landscape, but not a friendly one. Your photos are like poetry themselves. I’m so grateful to you for these posts. Thank you, Penny. I love sharing them. I just want to crawl into your pictures – everything is so green. 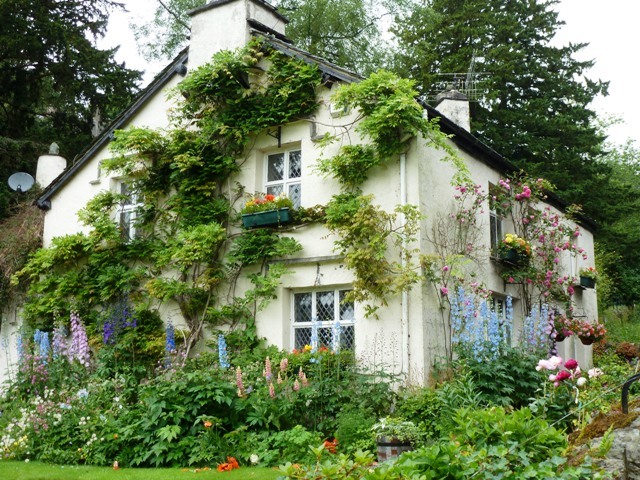 I love the house – am I correct, are those foxgloves growing out front? I’ve wanted foxgloves for years, but they don’t tend to do well here. We have some out in the backyard now, but they are only about 2 feet tall at the most. It’s so hard to keep the garden nice in a drought! I think its mostly delphiniums in the garden, actually. Whatever they were, they were gorgeous! I so relate to your visit to Houseteads. 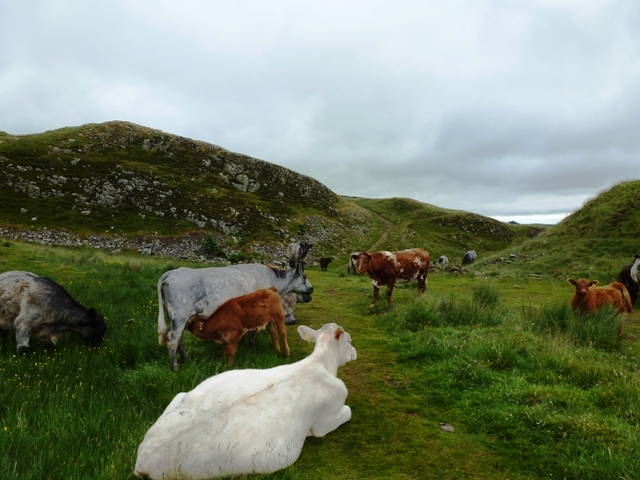 The first time I visited (also in the drizzle) I revelled in imagining those poor conscripts enduring these alien northern climes. The depressions on the stones between the latrines (apparently where those employed in natural functions passed the time by sharpening there swords) made the whole experience so real ! It really was an extraordinary place. I am so glad we got to visit and see it for ourselves. Sorry – what a dreadful typo by an author . . . “there” should read “their” – slapped wrists !